This section provides a quick introduction of light cone, which is a 4-dimensional surface in a spacetime frame where all events on the surface can be connected to a central event by light. What Is Light Cone? 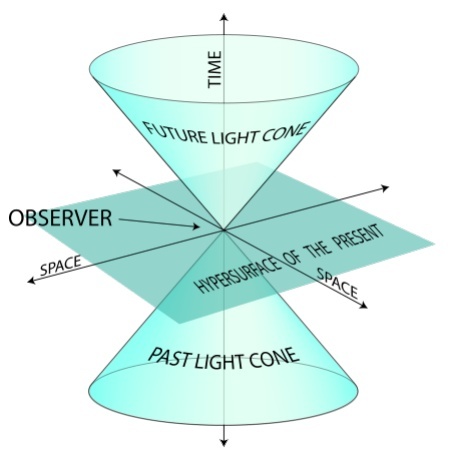 A light cone is a 4-dimensional surface in a spacetime frame where all events on the surface can be connected to a central event by light. Future Light Cone - The surface where all future events that can be connected to the central event by light. Past Light Cone - The surface where all past events that can be connected to the central event by light. Ignite a fire and consider it as the central event. At the next moment, the frontline of the light wave from the fire forms a sphere. As time goes by, this sphere grows very fast at the speed of light. The trace of this growing sphere is the future light cone of the event of igniting a fire.